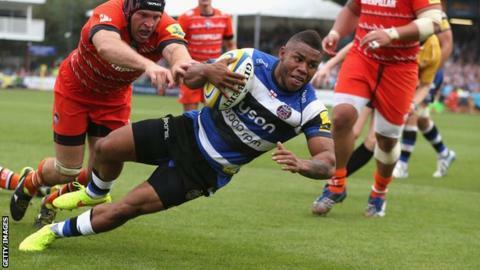 Bath continued their 100% start to the new season with a stunning victory over Leicester Tigers. The home side produced a devastating opening 40 minutes to lead 23-0 at the break, Semesa Rokoduguni and Jonathan Joseph touching down and George Ford kicking a further 13 points. Kyle Eastmond and Olly Woodburn scored to earn a bonus point after half-time. Peter Stringer's late try rounded off the win, before David Mele was sent off for stamping in the closing stages. It was a sensational performance from Mike Ford's side, who began the campaign with victories over Sale and London Welsh but had yet to hit the levels they managed against Leicester. The Tigers, also unbeaten coming into the match, did have to make do without centres Manu Tuilagi and Anthony Allen, however, after the pair were injured in the build-up to the game. The 45-0 loss to Bath at The Rec was Leicester Tigers' heaviest-ever defeat in the Premiership. They looked short of their best from the start and wing Rokoduguni gave the hosts a deserved lead inside the opening 10 minutes, resisting Niki Goneva's tackle to finish smartly into the corner following a fine team move. Having converted, Ford kicked another penalty before Joseph increased the lead further when he burst through from 22 metres out to leave Leicester reeling. Ford was again successful with the conversion, and added a second penalty and a drop goal to round off a remarkable first half. Bath saved their most eye-catching rugby for the second period, which culminated in Eastmond's terrific try. The home side recovered from a defensive situation to run the ball from underneath their own posts, with Joseph making the initial break, before some brilliant handling allowed centre Eastmond to twist his way over under pressure. The hosts refused to ease off, with Woodburn then touching down to wrap up a bonus point, latching onto Ford's long kick forward to stroll through and score. The Tigers pressed forward in an attempt to rescue something from the match, and Nick Auterac was sin-binned as he scrambled back in defence to leave Bath a man short for the final 10 minutes. But it was the home side who would round off the scoring, Stringer starting and finishing another breakaway which stretched the length of the field, and Ford converting once more to make it 45 unanswered points for the Blue, Black and Whites. There was even time for Mele to receive a red card, sent off by referee Wayne Barnes for stamping at the breakdown to compound Leicester's misery. "Today, we were pretty good in all aspects, relentless really - to nil Leicester is absolutely fantastic. "We know they have got injuries but the way we played, the way we defended and attacked, was outstanding. "The forwards set the platform, and the kids really enjoyed themselves behind the scrum. "We've got Northampton away now, which is a sobering thought." "Credit to Bath - it was pretty average from us, at best, and we got exactly what we deserved. "It is my responsibility, my fault. I pick the team, I coach the team, the loss today is down to me. "They (Bath) played very well and we couldn't cope with the physicality with the side we had available. "We got beaten at every contact, every scrum, every line-out, every bit of skill. "It hurts every time you play as poorly as that - we got our backsides smacked and that's how it is." Bath: Arscott; Rokoduguni, Joseph, Eastmond, Banahan; Ford, Cook; James, Webber, Wilson; Hooper (capt), Attwood; Fearns, Mercer, Houston. Replacements: Dunn, Auterac, Thomas, Day, Fa'osiliva, Stringer, Devoto, Woodburn. Leicester Tigers: Tait; Morris, Smith, Williams, Goneva; Burns, B Youngs; Mulipola, Ghiraldini, Balmain; Kitchener, Parling; Croft, Salvi, Crane. Replacements: T Youngs, Brugnara, Pasquali, De Chaves, Barbieri, Mele, Harrison, Pohe.